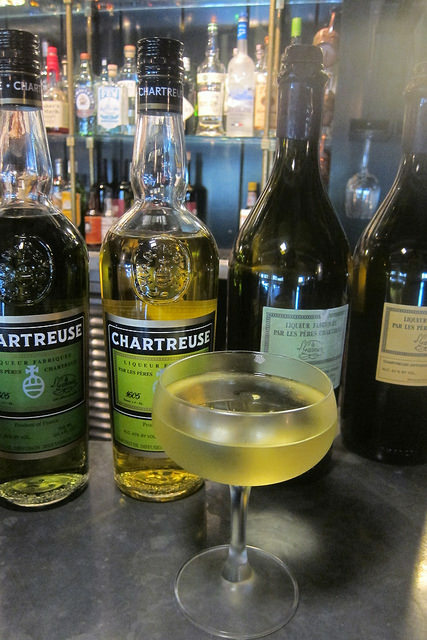 Chartreuse is a hugely popular liqueur made by Carthusian monks in France. There’s a lot of lore about the liqueurs. I knew that only 2 monks at a time know the complete recipe. I didn’t know that the monks were only allowed to drink it only twice a year (Easter and Christmas). The order is a silent order so they are allowed to speak only one day week. Some people might wonder why a religious order would produce alcohol but it was originally produced as a health tonic. Like bitters, it was later discovered to taste so good, people started drinking the liqueurs socially. Green Chartreuse is very high proof, coming in at 110 proof and Yellow Chartreuse is 80 proof. I prefer the Green Chartreuse generally but like the Yellow in drinks such as the Alaska (and Alaska #1 which includes sherry). Stir all ingredients including the orange bitters and strain into a chilled coupe. 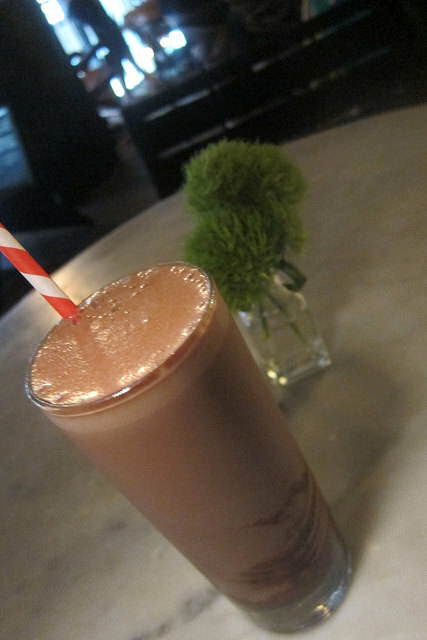 Daniel Sabo from the Ace provided this recipe for his Green Chartreuse Egg Cream. Add the chocolate syrup then Green Chartreuse and combine with milk. Add the soda to the glass while stirring. Green Chartreuse despite being so vegetal mixes really well with chocolate. Try a few drops in your hot chocolate next time like they do in France. 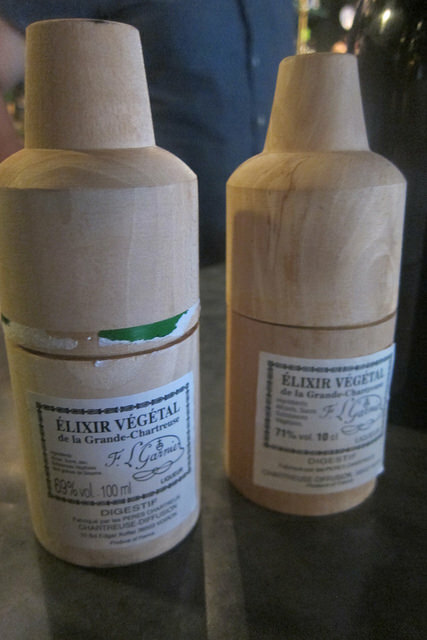 I’ve had the magical Elixir Vegetal which is not available in the US (you can buy it from pharmacies in France, however). The Elixir was the first product that was produced after the monks were gifted with the recipe. Currently it’s sold at 69% (or 138 proof). It used to be produced at 71% (140 proof). It’s considered a digestive and you take about a cap’s worth to settle your stomach. Right now, only the Green, Yellow, Green VEP and Yellow VEP are available in the US. VEP means the Chartreuse has been aged longer in oak barrels. Tasting through the range, I discovered my love affair with Green Chartreuse remains strong but discovered a new appreciation for Yellow VEP. Fun experiment- buy Chartreuse and stock it away for five years. It’ll taste even better than before. Or just find the oldest versions you can buy. You can figure out when it was produced by the code on the cap. There is a series of numbers preceded by the letter L (stands for lot number). You take the first three numbers and add it to 1084 which is the year the Chartreuse order was founded (Chartreuse liqueurs weren’t produced until 700 years later). Let’s say you got the numbers 930, add to 1084 and you get 2014. The last three numbers is the day of year it was sealed. For example, L930201 would mean that bottle of Chartreuse was bottled on the 201st day of the year in 2014. This entry was posted in alcohol education, alcohol tasting, bar stalker, bar stories, bars, bartenders, cocktails, events, history, hot bartenders, la, la cocktails, los angeles, spirits, the minty and tagged drinkwire, elixir vegetal, green chartreuse, green chartreuse vep, la cocktails, the minty, yellow chartreuse, yellow chartreuse vep. Bookmark the permalink.